Sitelink extensions allow you to display extra links below your adverts, allowing you to direct users to the most relevant pages within your website. They allow you to occupy more space on the first page of Google which in turn increases the likelyhood that your advert will get clicked on. A study by Google suggests that by using Sitelink extensions you can increase your CTR by around 20-25% on unbranded terms and up to 50% on branded terms. They allow you to direct people to the most relevant landing page which can help increase your conversion rate. They allow you to highlight certain benefits and features, for example, that you offer free shipping. They allow you to push other products and services that you provide. Sitelinks will often be shown alongside your advert if you appear in one of the top 3 positions, and in some cases a short two line description will be shown below your sitelink extensions. These are known as enhanced sitelink extensions and I will come on to those later on in this article. There is no cost for setting up sitelink extensions, you just pay the same cost per click as you would for your standard advert. If somebody clicks on one of your sitelinks twice, then this will be counted by Google as an Invalid click and you will not be charged for it. 1 How effective are sitelink extensions? 3.1 Do enhanced sitelinks work? 6 Why are my Sitelink extensions not showing? 6.3 Reason 3. Your sitelink extensions were not approved. How effective are sitelink extensions? Their CTR increased significantly from 1.16% to 1.90% which is an increase of 64%. I would presume that these results were better than the average of 20-25% increase that Google states, as the people over at PPC Hero know their stuff and they will have got the structure right and will be implementing best practices, which a lot of advertisers are not doing. This test should be fairly true as it was only conducted in campaigns where there were no changes to the adverts, keywords or campaign settings that might effect their click-through rate. The only real limitation is the fact that it is only a study of one account in a single market so the results may vary depending on the market. Just like you would split test your adverts, you need to split test your sitelink extensions. When you do this you should compare your sitelink performance with other sitelink extensions as opposed to your overall ad performance. You also need to analyse what is working well as this will give you insight into what searchers are attracted to. A great example of how this can be used was given by Hayley Coutinho from Receptional. Hayley suggests that if a sitelink to your sales offer page is receiving a high CTR, you could try other sitelinks that focus on price, savings or promotions you have running. If you have a sitelink directing users to a product category perhaps you could use this information to create a new sitelink that uses a price led title instead, for example, ‘Bow Ties From £9.99’ instead of just ‘Bow Ties’. Many advertisers don’t fully take advantage of the fact that sitelinks can be added at either campaign or ad group level, which means that you need to have a logical structure. For example, if you have an ad group that sells red men’s shirts, the chances are that there will be several different sizes and styles of these shirts. Some will have a checkered patten, some will have a striped patten, some will be long sleve, some will be short sleve. So you can use sitelinks to drive people to the most relevant section before they even hit your website. So, for example, you have an ad group with an advert for men’s red shirts, you could create ad group level sitelinks such as ”shop striped red shirts”, ”shop checked red shirts”, ”shop plain red shirts”. This way you can direct people to the most relevant type of shirts straight from your adverts, so they don’t have to search around on your website for them, which will help increase conversion rates. Here is an advertiser doing this for their yoga pants. They have a generic yoga pants advert in an ad group and they have added sitelinks to direct people to the most specific type of yoga pants. You can also use sitelinks to segment users using by brand. People will be interested in the different brands of product that you sell. Here was the example that he gave. The Gap has five brands including: Banana Republic, Old Navy, Athleta and Piperlime. For the Gap, Sitelinks helps drive sub-brand awareness and drive users to the most relevant brand. My final example of segmenting users is by using sitelinks for your branded campaigns. Before sitelinks were introduced you had no other option than to send people directly to your homepage. However, if you use sitelink extensions, then you can make your brand traffic work harder by using sitelinks to drive people to the most relevant category of products. A good way to improve the proportion of people who click on your sitelink extensions is to include call to actions, such as ”shop” or ”buy” instead of just saying ”checked red shirts” instead say ”buy checked shirts” or ”shop checked shirts”. You can also use this technique if you are using adwords for lead generation. Loredana Bleiziffer from Periscopix recently published a case study where they used this technique. She ran a test where they used call to actions in their sitelinks to get users to take a particular action. The account that she ran it on was generating enquires for student flats. Their objective was to measure the number of blog visits, general enquiries, brochure enquiries and bookings, so she added different sitelinks that told users to take these actions. Here are the results. 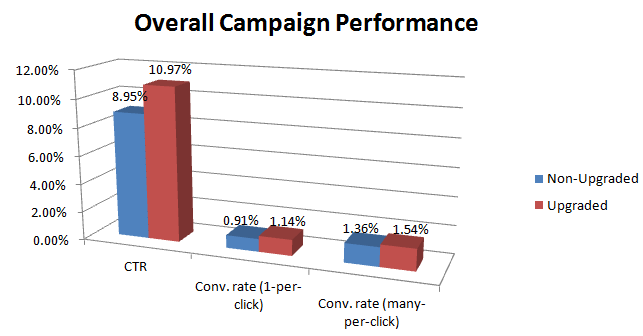 As you can see by using call to actions, there was a significant increase in click-through rates and conversion rates. You can apply this to just about any lead generation business. Not only will general enquires have value to your business, but somebody downloading a white paper, a case study or your pricing guide is also likely to have value to your business, so you can add call to actions within your sitelinks to encourage users to take these actions. Sitelink extensions are a great way to run promotions, without having to change your ad text. This is especially useful if you are a large ecommerce company and you want to run a sale across your whole campaign which might have tens of thousands of adverts. Sitelinks can be easily set up and allocated to specific ad groups or whole campaigns which gives you a large amount of flexibility. They can also be scheduled so that they will only run for a set number of days while you are running your sale and then be paused automatically when your sale has finished. One classic mistake that I see quite regularly is not having enough sitelinks per ad groups or campaign. 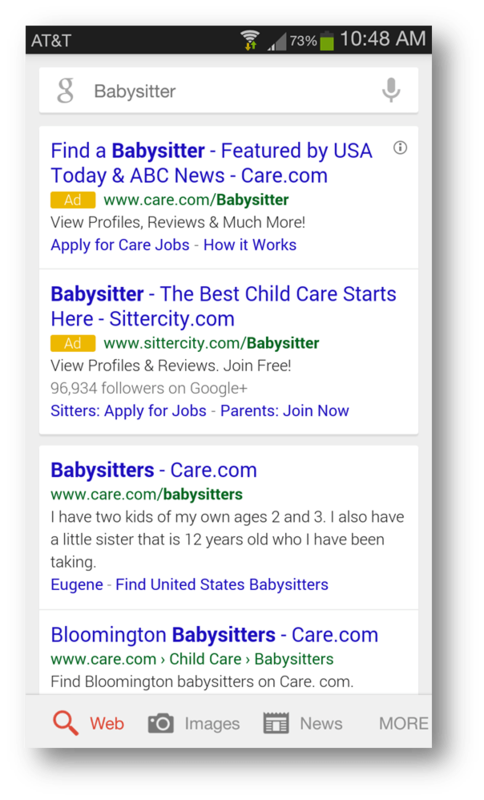 Extended sitelinks allow you to add an additional two lines of description below your sitelinks, which turns them into mini ads by themselves. Here is an example below, as you can see they are a great way to occupy more space on the first page of Google. However, to be shown they require an extremely high Ad rank, which means that they only show when you have a high combined quality score and CPC bid. For this reason we generally only recommend adding these to your branded campaigns. Wordstream ran two case studies into enhanced sitelink extensions. The first one was on a travel agency account in the Uk. To keep their tests fair they kept their sitelinks consistant across their account. 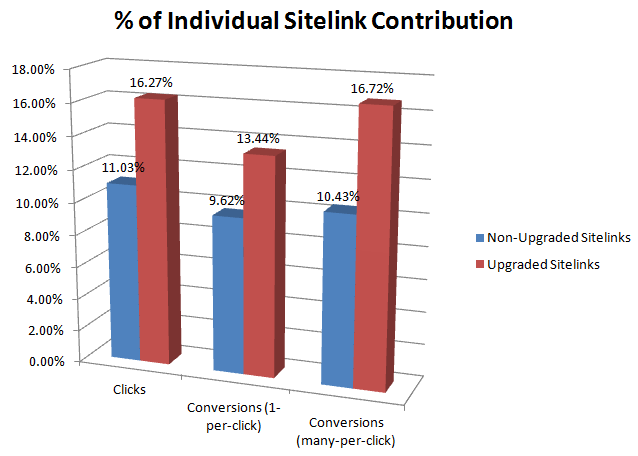 As you will see from this graph, there was only a small increase in click-through rates when using enhanced sitelink extensions compared to standard sitelink extensions. The increase was a very small 0.04%. However, the most concerning result was the drop in conversion rate of -17.1%. The main limitation with this study is that it is in a seasonal account where a change of 3 weeks could make a huge difference to CTR and conversion rate, which could explain the decrease in conversion rate. When looking at the actual sitelink contribution themselves Wordstream found very different results. Here you will see that there was very little difference in click-through rates for upgraded and non-upgraded ad extensions. However, it actually turns out that adverts that have upgraded sitelinks did actually have a higher conversion rate. They also ran a test on an ecommerce campaign for a shoe retailer. This is more likely to give consistant results as there will be less of a seasonal effect. Here they found that there was an increase in click-through rate of 22.25% and an increase in conversion rate of 25.3% which can make a fairly large improvement to your account. There was also a 13.2% increase in multiple conversions. These results were also found when looking at the individual sitelink contribution. 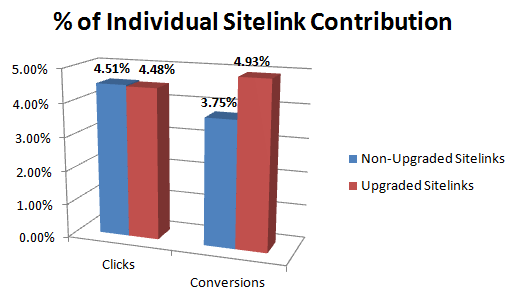 Wordstream found that the individual sitelinks had significantly more impact on clicks and conversions. The two graphs show that by adding extended sitelinks it improves both click-through rate and conversion rate. I would suggest that sitelinks are effective at improving click-through rates. If you are running your adverts on mobile devices, then you need to create mobile optimised sitelink extensions. 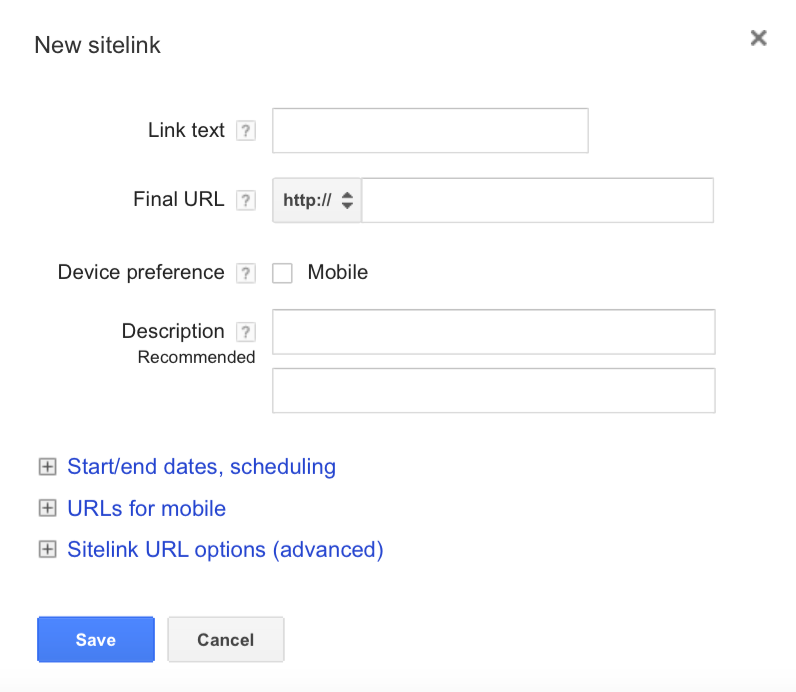 So you might be wondering what makes a mobile sitelink extension different from a normal sitelink extension. The answer is the length of the sitelink. Even though on both mobile and desktop devices the sitelink character limit is actually the same, which is set at 25 characters, you don’t actually want to use all of the 25 characters on mobile devices or you are going to end up with the problem that this advertiser is having here. You will notice that when you use a 25 character long desktop sitelink on mobile devices that only one sitelink will appear. Creating mobile optimised sitelinks is straight forward, when you are creating your link text limit yourself to just 15-17 characters. You also need to tell adwords that you only want the extension to show these shorter sitelinks on mobile devices, as you want to show longer 25 character ones on desktop devices as these allow you to occupy more space on the first page of Google. To tell Google to only show your shorter sitelink extensions on mobile devices then just check the mobile preference box when creating them. 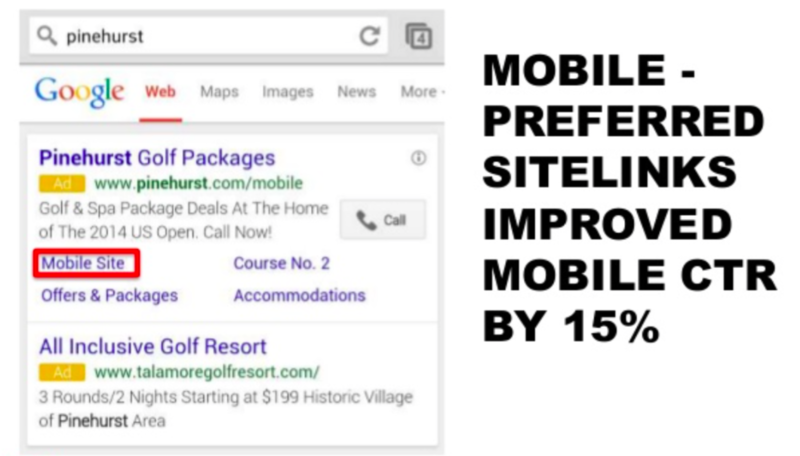 Simply by creating shorter sitelink extensions such as these, it will allow you to increase your click-through rate on mobile devices by 15% according to a study which was conducted by PPC Hero. Step 1. Go to the Ad extensions tab within your account. Step 5. Once you see a popup that looks like the one below you need to setup your sitelink. Enter what you want your sitelink to be in the link text box and the URL that you want people to be directed to once they click on your sitelink below. Step 6. If you are creating shorter 15-17 character sitelink extensions that should only be shown on mobile devices check the mobile preference box, otherwise leave this unchecked. Step 7. If you would like to create enhanced sitelink extensions then you should enter the optional two lines of description.As I mentioned above, as a rule of thumb, only add the two optional lines of description if your sitelinks are for your branded campaign, otherwise they are unlikely to be shown. Step 8. If you would like to schedule your adverts to show only in a certain date range, then you should expand the ”start/end date, scheduling” tab and then enter the dates or times that you want your sitelinks to show. This can be useful if you are running a promotion for a limited time. Step 9. If you are an advanced Adwords user then you may want to tag the URLs of your sitelinks so that you can analyse your data in Google analytics, which I will talk about later in this article. Step 10. Click save and there you have it, your first sitelink extension. If you are struggling with these steps, you can check out Google guided tour by clicking here. Why are my Sitelink extensions not showing? There are several reasons why your sitelinks may not be showing alongside your adverts. One reason may be that your advert is not appearing in one of the top three positons. Only these top 3 positions are eligible to show sitelinks so if you’re not placed there, your sitelinks sadly won’t appear. So if you want to improve your ad rank and increase the percentage of time that your sitelink extensions are being shown, then you need to either increase your bids or improve your quality score. This is the reason that most of the time extended sitelinks will not appear. They will generally only appear when you have a very high Quality score and CPC bid combination, a common example of this would be your branded keywords. Google also states that they don’t just look at the quality score of the keywords, but they also take into account the relevancy of the landing page to the sitelink. So, to improve the chances of being shown, ensure that your landing page and sitelink text are closely aligned. Reason 3. Your sitelink extensions were not approved. For your sitelink extensions to show they must first be approved by Google. To see if your sitelink has been approved check the status column while viewing your sitelink extensions, within the ad extensions tab. If your ad has been disapproved then ensure that you are not breaking any of Adwords sitelink policies. There are several tools within the adwords interface that allow you to measure the effectiveness of your sitelink extensions. This can then be used to make strategic decisions to optimise your sitelinks. When analysing your sitelink extension data, you firstly need to ensure that you have enough data to make a statistically significant decision. Sitelinks drive much lower volume than your main ad will so you may have to wait a couple of months until you have enough data. Secondly treat your sitelink extensions like you would your ad copy and learn from your winners and losers. Write new sitelinks based on your winning sitelinks language. There are three main reports for analysing the effectiveness of sitelink extensions. The first one will allow you to see whether users clicked on the headline of your adverts or whether they clicked on the sitelink extension itself. To view this report click ”segment” and then ”click type”. You may wonder why your sitelink has a much lower click-through rate than the headline of your advert. The reason for this is that searchers are much more likely to click on the main advert than they are the sitelinks below them. This report will allow you to see the click-through rates of the individual sitelinks themselves. This is really useful data for conducting split tests of your sitelink extensions. To view this report click ”segment” and then ”This extension vs another”. The ”This extension row” of this report will show you the individual data for that extension such as the click-through rate and cost per click. The ”other” row shows you the data for the other parts of the advert that this extension was shown alongside which allows you to determine if this specific sitelink extension contributed to the overall performance of the ad. To see this report view your sitelink extension data and then click ”segment” and then select ”devices”. This will then show you a report that looks something like this, which allows you to see how your sitelink extension performed on mobile compared to desktop or tablet devices. This report allows you to see the overall performance of your adverts while sitelink extensions were being displayed. If you are interested in tracking your sitelinks in even more depth using google analytics, then I highly recommend reading ‘Measuring your sitelinks from your Google Adwords campaign’ by Brittany Baeslack. I would also recommend ‘Measuring sitelink performance in Adwords and Google analytics’ by Andrew Barberson. By tagging the the URL of your sitelink extensions as follows. sitelink = [description of sitelink here] . so for example:www.CompanyA.com/contactus?sitelink =contactus. this will allow you to track your sitelinks in the analytics interface. By using the analytics interface you can drill down and find out more information about your sitelinks, such as which campaigns and ad groups triggered them. You can also setup custom reports to show you your statistics for your sitelinks. As Brittany covers this very well in her article, I won’t cover this again. Hello Wesley, I really enjoy to read this post. Very informative & helpful post. Thanks David, glad to know that you found it useful! Hi M Holland,On mobile, we only show a mxamium of two sitelinks. If you have more than two sitelinks already set up for your desktop campaign and change your campaign settings to target mobile as well, we will use the first two sitelinks listed in your Ad Extensions tab. Hi Ger, It will use a range of the available Sitelinks that are set up for that campaign. I would suggest creating some shorter Sitelinks that are specific for mobile devices, by checking the mobile box when you get to step 5 of this guide. How many sitelinks can you get on moblie? is it just two as in the example or is it 4 as in desktop search?if you have 4 sitelinks for desktop and change your settings to target moblie as well…which of the 4 sitelinks will show if only 2 are allowed on moblie? Hi Inetds, the most that I’ve seen was 4 Sitelinks on mobile devices, but they were just single words. Any of the 4 will be eligible to show, Googles Ad rank formula will be used to decide which Sitelinks should be displayed for which search query. If you would like 2 specific ones to be shown on mobile, you can give them mobile preference so they would be chosen first when Google selects what sitselinks to show. I love what you guys are up too. This type of clever work and coverage! Keep up the great works guys I’ve incorporated you guys to my personal blogroll. Glad you enjoyed it Meghan! Really interesting stuff for someone who is just getting to grips with PPC and beginning to experiment with ad extensions. However please in future posts watch your grammar, it was so poorly spellchecked that at times I was reluctant to continue through the post. Overall great job though. Hi Lauren, Glad you found the post interesting we will go through and review the grammar! Nice post. I liked this information! Thanks Wesley for sharing fruitful information! Keep it up! Hey Wesley! Very informative Article, Thanks for sharing this perkful information for Sitelink data analysis. keep it up !! Hey Wesley! I love this article! It is really interesting!